In this post, we’ll allow the user to select a table name from a data validation drop-down and our Excel formulas will operate on the values from the selected table. Thanks to Neelima for asking about this technique! Before we get too far, let’s be clear about our objective. We have several data tables in several worksheets in our workbook. Each table stores data for one department. For example, here is the table for Department A, which has been named DeptA. We would like the user to pick a table name from a drop-down list, and we’d like our formula to provide the total for the selected department, as shown below. We’ll accomplish this with a little function known as INDIRECT. Let’s check it out now. The INDIRECT function returns a valid Excel reference based on a text string. The syntax follows. 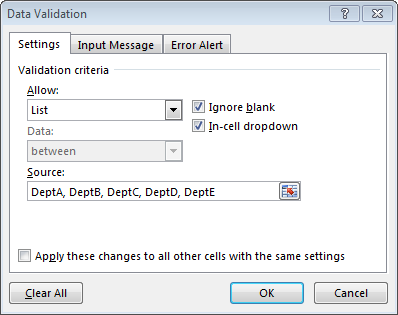 The INDIRECT function can create a valid Excel reference to a cell such as B10, to a range such as A1:B10, to a named reference, or to a table name such as DeptA. We have stored the data for our five departments in tables using the Insert > Table icon. We have named the tables DeptA, DeptB, DeptC, DeptD, and DeptE using the TableTools > Table Name ribbon field. Our objective is to allow the user to enter the table name into a cell such as C6. Let’s say the user enters DeptA into cell C6. We can’t simply use the C6 reference in a function such as SUM(C6) to sum the values in the DeptA table. This is because the SUM function will return the sum of its argument C6, which in this case stores the text string value DeptA. The SUM function would thus return 0. We need some way to tell the SUM function that we are not providing it with the sum range directly, but rather, we are providing it indirectly. That is, we are pointing it to the desired sum range. This is where the INDIRECT function comes to the rescue. It enables us to create a valid Excel reference from a text string, in this case, the text string of the table name stored in C6. Rather than summing cell C6, we tell Excel to sum the values in the reference stored in C6 with the INDIRECT function, as follows. The INDIRECT function converts the text string in C6, the table name DeptA, into a valid Excel reference. The SUM function sums the values stored in the DeptA table. Now, the user can type the table name into cell C6 and the SUM function will return the total of all cells in the table. If we want to allow the user to select a table name from a list of tables, we can use the data validation feature to provide a drop-down. On the input cell, we set up data validation (Data > Data Validation) to allow a list. We simply enter the table names using a comma-separated list, as shown below. At this point, the user can select the desired department from the drop-down, and our formula updates accordingly, as shown below. But, what if we want to do something more elaborate than just simply sum the values? For example, what if we wanted to do a lookup…can we do that? Yes! The INDIRECT function simply returns a valid Excel reference and can be used in other functions, including the VLOOKUP function. 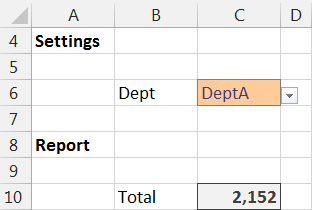 If we wanted to allow the user to pick a department and we wanted our report to pull in the account values from the selected table, we could retrieve the values using a traditional lookup function such as VLOOKUP. The lookup range argument would simply use the INDIRECT function to provide the desired reference. For example, if we wanted to look up the value for the account name stored in B11 and the table name was stored in C6, we could use the following formula. The resulting workbook is shown below. The INDIRECT function returns a valid Excel range. We can use it to convert a text string, such as the table name DeptA, into a valid table reference that can be used in formulas and functions such as SUM and VLOOKUP. Thanks again Neelima for asking about this approach! Easy to learn and nicely demonstrated. Very nice! what if for example, I want to use a better name for the drop down list. So I don’t want to see DeptA, I want to see Department A, or A Department. is there a way to change just the drop down to refer to a table? Thanks! To use a label in the drop-down other than the actual table name, you could set up a little mapping table and then use a lookup function such as VLOOKUP to make the translation. For example, a table could have a column for the friendly name used in the drop-down, and then another column that stores the actual table name. Then, your INDIRECT function would use a VLOOKUP to translate the selected label into the table name. I have a formula “=MAX(Table1[@[WISHLIST]:[MANUAL]]))” and i have this data in Table2 and Table3 too. Can you please advise the related INDIRECT formula i should use for dynamic table name? I could not do it. It works at Table1. But when I want to copy the formula and paste to Table2, it gives #REF error. My main purpose is following: I want to copy a formula -let’s say =MAX([[WISHLIST]:[MANUAL]])) or =MAX(Table1[@[WISHLIST]:[MANUAL]]))- from Table1 and paste it to Table2. While I paste in Table 2, the formula turns out =MAX(Table1[[WISHLIST]:[MANUAL]])). However, what I want is to capture Table2 data. not Table1. I hope it is clear enough. Any other suggestion welcomes. Kurt, I am pasting it on another Table which is located on another sheet in the same workbook. Bahar. Let me know if you need help setting it up. Jeff: This is close but my dilemma is I’m working with a workbook that the department does not want to modify too much. However, I’d like to replace a formula that currently uses mutliple nested ifs, sumif and indirect to reference a sheet name from a cell. I think I might have problems with my solution because it’s only the last 5 digits of the cell using the RIGHT function. This works ok because I’m referencing the table directly. But the file has several worksheets with the same data but for different cost centers. These cost center sheets are referenced in column I of sheet CA21. Again, only the RIGHT 5 digits. Any suggestions? As always, thanks for all of your info! You may be able to clear my little dilemma. I had thought I needed to do Indirect(B2) in there but that doesn’t work either. What am I missing?